Old companions and fresh heroes. New and ever more fantastical creatures and monsters. Banished gods and lost magic. Dragon overlords are taking over the world of Krynn. The Chaos War is ending. The Fifth Age is beginning. 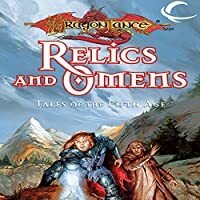 A collection of fantastical short stories exploring the new FIFTH AGE setting, from TSR's best known DRAGONLANCE writers.